After the clearing was done, coconut trees and the native zoysia grass were my first planting priorities. The trees would outline the walkways - would actually line both sides of the walkways - with a double row of trees on the side away from the sea, the west side. Before the trees were planted there were no walkways - so even before planting was begun I had to map out the overall and future design, the layout, for False Bluff. I mean, what's the sense in planting anything if you don't know where it's supposed to go, or what part of the whole it's supposed to be, or even what the whole is? So for days I sat near my tent with pen and paper; but mostly I wandered - back and forth, back and forth - as clearing and burning went on around me. I later learned that the people working with me thought I had endured some sort of mental glitch. They didn't get actually worried until I picked up a big stick. I used the stick to measure the distance between future-planted trees and the width of the walkways themselves. We're talking hi-tech here. And then, when I traded the stick for a shovel and began digging holes, everyone seemed to finally understand what was going on. My lack of Spanish, particularly nearly a decade ago, has been a problem. Try taking an English/Spanish dictionary into a hardware store in Bluefields and asking for 1,000 one and a half inch coarse sheet rock screws...or using that dictionary to explain a vision of how a design today will impact what a place will look like ten or fifteen years down the road - or even what the vision is - where tree-lined walkways and buildings will be. I've heard that many people who begin a project like False Bluff have a staff...of designers or architects or planners; but I'm not sure that's true. After the trees and the grass had been planted and become somewhat established, along the west side of all our walkways and just in front of the double row of coconut trees I planted what we fondly call "swamp lily," a spider lily that doesn't need a swamp to thrive. 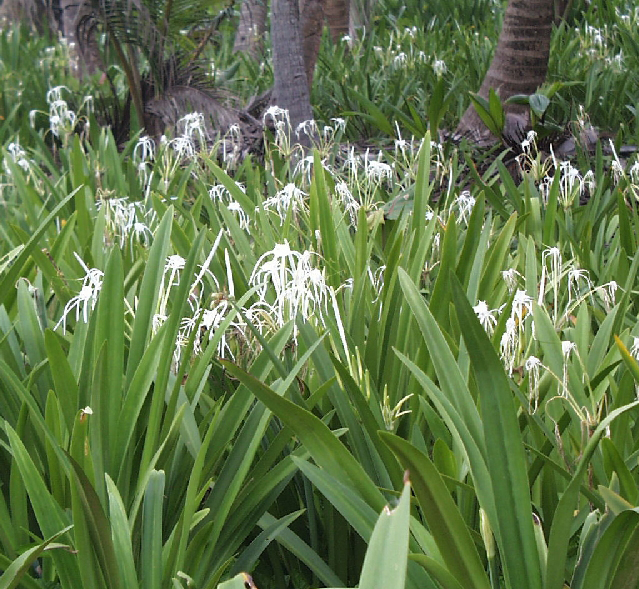 What I'd like to think we have at False Bluff is a variety of Hymenocallis known as 'Tropical Giant Sister' but what we do have is most likely just kinfolk known as "beach spider lily," the littoralis. At various nurseries in the United States you can buy one of these plants for anywhere from $5.00 to $19.00. I've pulled this picture off the internet. I've got lots...of the plant and of its bloom...but today I'm just not going to hunt one of them down. Besides, our clumps are young and not this showy yet. Our planting stock of this spider comes right from the property where there are clumps in odd places, some right at the edge of the beach. I have no idea how the hell they got to False Bluff because until this project began nobody had purposefully planted anything out there in decades; and where the existing clumps are indicate no sense of purpose anyhow. I do know that the plant is a hardy survivor and whereas I dig a hole for each one I plant, if you were to just throw one of the bulbs on the ground during friendly weather it will take hold where it lands - I've seen beach wash-ups that have done just that. The plant forms a nice clump pretty quickly and has the spidery, somewhat ethereal, bloom...and though the bloom scent is very faint it's also very sweet. The picture below is from 2015 just a day or two after the lilies were planted...maybe the same day from the looks of the disturbed earth around them. I planted one lily bulb - or tried to plant one - every 18" along the walkways...and there are a lot of 18" spacings along our walkways. This was taken this year and shows pretty much the same place. Nature at work, with a little guidance. It's all getting just a bit better every day.